Attached below are some squigglies of HR:Pw profiles from my own runs. Data indicates slope is very dependant on what the ambient conditions are. For instance, the body's challenge to cool is one fundamental driver of high HR. The body's ability to process oxygen at high altitudes is another. Long, slow, flat beachside run, hot and humid : First image is a long, slow controlled jog outdoors at 38 deg C, 50% humidity and medium wind for an effective temp index of 38. The squiggly goes straight up which is interesting. What this means is that under such hot conditions, prolonged exercise in low power still leads to gradual HR elevation or "drift". Treadmill run : Second image is from a 30 min easy run on a treadmill in an airconditioned gym. Power is limited to a tight range, run is well controlled and slope of squiggly is gentler than that of previous scenario. Interval training, beachside, hot and humid : An example of 2 x 6 min, interspersed with 3 min slow running. 35 deg C, 50% humidity and medium wind for an effective temp index of 33. Key information - recovery jogs involved dousing self with water, on the head, down the back etc. During work segments, convection helps a bit to dissipate heat. High altitude run : The last example is from a 40min run at high altitude, cool environment. Maximum elevation was around 11,800 ft and much of the running terrain was uphill, therefore power numbers are higher than equivalent runs done on flatland. This was the first run in such an environment, hence the body was coping with acclimitizing and effort can be classified oxygen limited. The histograms on the x-y axes are another key piece of data. Skewness of the bars indicate frequency distribution at high and low ends of the heart rate or power spectrum. Altitude running when non-acclimatized is a case of high HR dominant running, where those bars are skewed to the higher numbers. For example, a predominantly dual peaked histogram for running power could point to an interval session, as the third image shows. Another way to show the HR:Pw plot would be to express the numbers on the axis in terms of a percentage. This gives better visual cues on intensity, both to runner and a coach. Apart from looking at slope, the area distribution of running data on a HR;Pw map might also be useful. 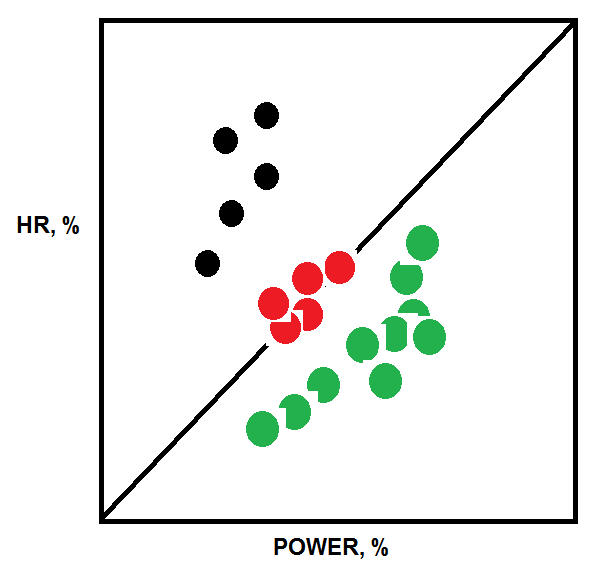 At a conceptual level, the way datapoints can be arranged on a %HR:%Pw plot is depicted below by 3 types of colored dots. High HR:Pw runs in black and low HR:Pr runs in green. Red dots falling on the diagonal line might be an idealized scenario, where the increase in HR follows organically from an increase in running power. Heart rate to power ratio with frequency distribution information is one quick and easy way to classify the intensity of run. The advantage of the HR:Pw plot is that it captures whole body state of affairs (HR) and activity specific intensity (power). Ofcourse, the Hr:Pw profiles maybe slightly different for everyone, since everyone reacts a bit differently to temperature, humidity, altitude and stress. Looking at runs in this way also helps in controlling for ambient factors and in trying to compare apples to apples when analyzing performance across several runs. Read more of my articles at Running Science.